Starring: Lorenza Izzo, Ariel Levy, Daryl Sabara, Kirby Bliss Blanton, Aaron Burns, Antonieta Pari, Ramon Llao, Magda Apanowicz, Sky Ferreira, Nicolas Martinez, Ignacia Allamand, Matias Lopez, and Matias Lopez. Reviewing this is a mixed bag of emotions. If I was to review it on the gore, and makeup alone then it’s brilliant. But being an honest reviewer you can’t just rate a movie on a one sided reality. I am a fan of Eli Roth, and his simple world of gory horror. One thing I enjoyed about Green Inferno was the throwback to 70's and 80's Grindhouse films. I have a wicked love for Cabin Fever, Hostel and Hostel 2. I am one who enjoyed Hostel 2 more than part 1. Now let’s make something very clear, Roth is not one that make scary movies. His ability is not scary, it’s gross out, or simply put, to cause a reaction of a disturbing nature. From that stand point he works. None of the mentioned films are scary. The films mentioned are the definition of horror, and The Green Inferno is a definition of horror. Horror states an intense feeling of fear, shock, or disgust. Roth gives the disgust with a crystal clear clarity that he works so well at. If I was to rate on that reality then this film is a Golden Ticket. But I don’t rate films that way. The plot is very simple. A corporation is tearing down the rain forest, and murdering local tribes inside the forest. An activist group decides to go to the Amazon, and make a political stand. Joining the group is college freshman Justine who basically comes aboard because she is attracted to the leader of the group. Once in the Amazon it doesn’t go as planned. 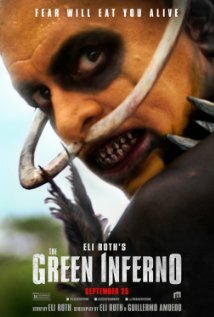 The Green Inferno has all that shocking, bloody murder moments, and disgusting gore that you would expect from a film paying homage to such gems like Cannibal Holocaust, and all over the top films of the 70’s and 80’s that explored the depravity of cannibalistic tribes, and flesh eating humans. 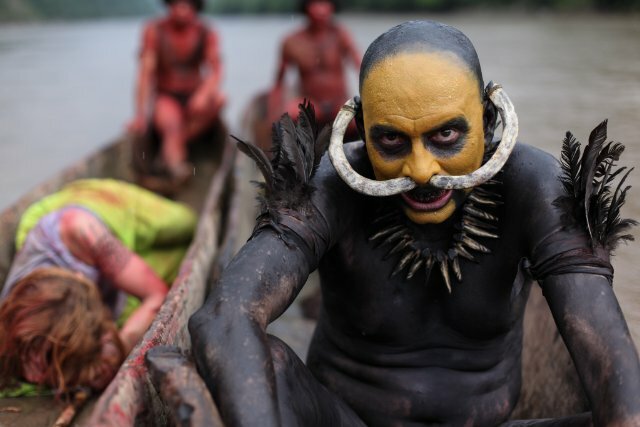 The Green Inferno has its major flaws. Character development it lacks greatly. Certain moments are ludacris, and had no purpose or bearing in the film such as the masturbation shot. Yes it was created, to make the character all the more hated, but was unrealistic in his actions. The other problem was the CGI. I am not against good CGI. What I am against is bad CGI. It’s okay to have CGI in horror films as long it’s done right. The ants in this film on a particular person, was so fake looking, and godawful that it had me rolling my eyes at how stupid they looked. The movie is a rehash of all the older 70’s and 80’s film of this nature. It basically pays homage to the classics. Nothing will ever beat Cannibal Holocaust, and I am not saying that The Green Inferno tried to, what I am saying, sometimes the same storyline, or plot to films become a little boring. Watching The Green Inferno you as the viewer already knew what was going to happen. It didn’t take a rocket scientist to know what was going to happen next. That is also the plus about this movie. You go into these films for simple, gory entertainment. Sometimes you hope that at least there will be a story, or something new to praise, but in the end most of the time it’s the same thing over, and over again, sometimes it works and sometimes it doesn’t. The Green Inferno’s stake in the heart was that it suffered limbo for over 2 years. Created in 2013, and finally saw the light of day in 2015. The problem that happens with this is people start to anticipate, and come up with ideas of how truly disturbing it is. People build a mythos around the film that never lives up to the hype. The Green Inferno I think suffered from that reality. The buildup was great. Also when a movie is in limbo it becomes fair game to online illegal postings. The Green Inferno was one of those films that people could watch illegal down loads, and could easily find online. In reality, the film suffered financial problems and not because of content. It was in limbo because of money. The other problem with the film is there is no real likable characters other then 2. I enjoyed the character of Lars, played by the wonderful young actor Daryl Sabara. I have been a fan of Sabara for many years. I loved him as Juni in the Spy Kids films. He is a great natural talent behind the lens. He was funny in the part of Lars, and ultimately made you believe his reality. The next character that stood out was Aaron Burns as the character of Jonah. Now a little trivia for you. Aaron has worked with Roth, and this Rat Pack of Splat group of Quentin Tarantino, Eli Roth, and Robert Rodriguez. Burns is also, besides an actor, a visual effects artist working on 2007’s Grindhouse, and Planet Terror, 2007’s Machete, and 2013’s The Green Inferno, also working the graphic design department of 2005’s Sin City. Plus Burns is also in two other related Roth films. Eli presented and produced 2014’s The Stranger, Burns is the character of Officer Harris in The Stranger. Burns plays Louis in Eli Roth’s 2015 Knock Knock. 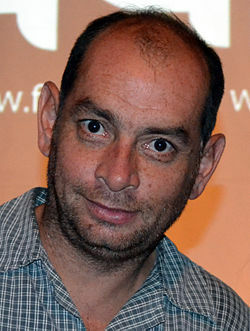 The Green Inferno is co-written by Roth, and also Guillermo Amoedo. Both have worked together before on 2012’s Aftershock, Roth as I have stated produced Amoedo’s films, 2014’s The Stranger. They also worked together on Roth’s new 2015 movie, Knock Knock. That is something else unique about Green Inferno, many of the actors or behind the scenes people have been a part of the same team in many films. Lorenza Izzo who plays Justine, your main lead in Green Inferno has also been a part of Aftershock, Roth’s Hemlock Grove, The Stranger, and Knock Knock. You see, she is married to Roth. So I guess it’s a great reality when you have an actress, and a director as a married couple. Green Inferno also stars Ariel Levy who has worked in Aftershock, The Stranger. Nicolas Martinez who also has starred in Aftershock. Ignacia Allamand who also starred in Aftershock and Knock Knock. The two main characters that are truly amazing, and disturbing is the two main baddies. The Head Hunter who is amazingly played by Ramon Llao, he also played in Aftershock. His character of Head Hunter is one that stands out, and is an imagery of disturbing forcefulness that lingers with you. Next would be the Character of The Village Elder, played by Antonieta Pari. Pari is amazing in this part and another one of those movie characters that makes you remember them. Both Llao and Pari are true cinema monsters. I also have to mention the beautiful cinematography. The places it was filmed was amazing. The shoots in Peru and Chile are stunning and give a realistic reality to the film. So I am going to rate this film a little different. I am going to use a number chart. 10 being the best. 1 being the worst. I want to rate this film different because of the categories. Some of the realities of the film stand out and also for fans of these styles of horror films, get them, enjoy them. Some will like, and some will not. There is a huge fan base to cannibal films, and for that reason I rate this movie differently. Final Verdict: For fans of gory horror. Lovers of cannibal films. Movies paying homage to 70’s and 80’s Grindhouse films, then I feel it’s a must. For the average movie lover, I don’t think you will get this style of film. This is geared to a select audience of gore-whores and 70’s and 80’s Drive-in Grindhouse film lovers. On a funny note, I made my mother watch this. She flinched and covered her eyes in many of the violent, and over the top gore moments that Roth captured in great detail. He elicited an emotional response from my mother, which he accomplished perfectly.